What could be better than a big lottery win? A big lottery win you can share with your friends! 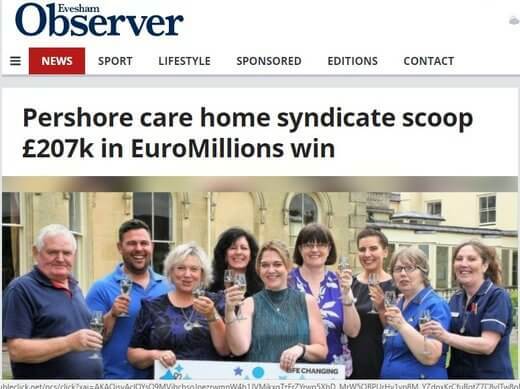 A ten-strong syndicate of workers at a nursing home in Pershore have just scooped a £207,435.10 prize in the May 5 draw of the Euromillions lottery. The group who call themselves ‘The Brickle 10’ discovered they had won a significant amount when two members checked the result through their phones while at work. Syndicate leader Shirley Archer arrived to see them trembling with excitement. The immediately decided to call the other members, some of whom were not at work at the time. Then it was time to share a bottle of champagne and some cakes at the office. The happy group are now contemplating splurging on holidays.